I made this healthy chocolate chip cookies recipe so I could finally feel good about eating my favorite treat complete with natural sweeteners and no oil. Can Chocolate Chip Cookies be Healthy? Though a bit of a health nut, I’ve always had a weakness for a delicious homemade chocolate chip cookie. It never helped when Betsy would bake her delicious batches of traditional cookies. I love her cookies but didn’t love the guilty feeling of eating all the unhealthy ingredients. Also, I wanted to find that perfect chocolate chip cookie that is delicious and healthful. I knew that making a healthful cookie wouldn’t give us the same type of taste, but was confident I could create something that could still satisfy our sweet tooth! 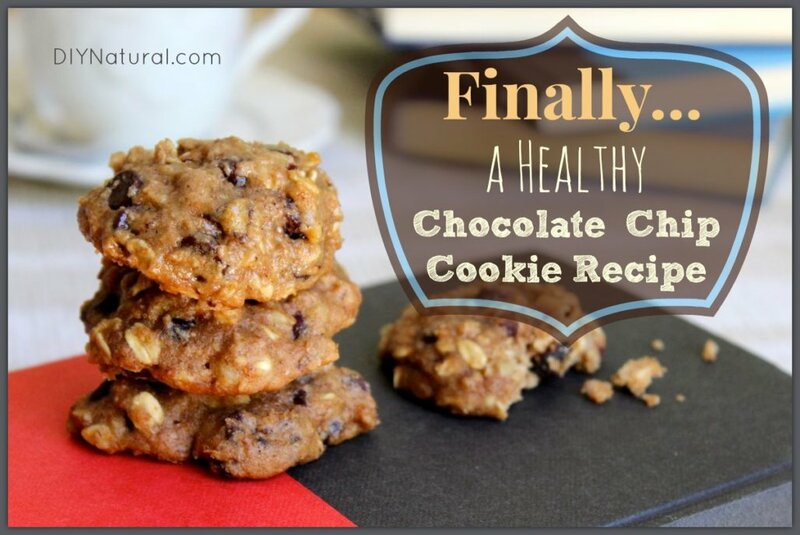 So one rainy day I set out to create the perfect healthful chocolate chip cookie recipe. As a result, I’m happy to report that my commitment paid off! We now enjoy this dessert masterpiece not only after meals but also as a snack and even as an occasional quick breakfast. The recipe freezes well, in fact, I prefer them frozen so we usually freeze half for me and refrigerate Betsy’s half (although they don’t need to be refrigerated). Finally, we’re happy to share our delicious discovery with you! Preheat oven to 350°. In a mixing bowl, combine all the wet ingredients (I partially soften the butter first, just be careful not to melt it too much). Stir them together with a wooden spoon. In a separate bowl, combine the dry ingredients. Slowly add dry ingredients to the wet, stirring thoroughly to combine. Add any desired finishing touches. Place cookies on baking sheet and bake for 12 – 14 minutes, depending on your oven and how well done you like your cookies. Enjoy fresh out of the oven, or frozen and thawed for a few minutes. Note: Remember, these healthy chocolate chip cookies freeze well, can be eaten as a breakfast meal, and are a great healthy treat for any time of day. These are more bread-like and soft than traditional chocolate chip cookies, and will not get stale if left at room temperature for a few days. Enjoy! what is the nutrition information for this? please and thank you. GREAT vegan tips Lauren, thanks for sharing. Glad you like the recipe. Blessings. I made these cookie tonight. Used the bananas, and didn’t grind my oats. Also the only “nuts” I had were a tropical trail mix with spicy peanuts and M&M’s. The batter seemed kind of loose for cookies so I put the mix in my mini muffin tins and baked for 15 mins. They came out great! The boyfriend was surprised he could take a few for breakfast in the morning and not feel guilty. We discussed different variations while trying them hot out of the oven. For more of a dessert spin I’m going to try craisins, pecans, and mini white chocolate chips. I’ve been stalking your site for a few weeks now and have tried many of the recipies and cleaning concoctions. I had already been making my own laundry soap similar to yours and just knew there were other ways of streamlining our household into a much more natural and budget friendly space. Thank you for all that you and Betsy do! It gives the rest of us hope that one day we all can live sustainably and we won’t have to sacrifice time and convenience. That’s awesome to hear Bayje, and thanks for stalking the site, lol. We do what we do because we feel it’s our calling, and we’re so happy can spend our time creating and sharing information to help people live healthier, more sustainable lives. That muffin idea sounds great! These cookies are delicious and guilt free. I added flax and only had about 3/4 cups of oats but they still came out great. Thank You So much for posting these cookies. They are like chocolate chip muffin tops! Not cookie like, but super yummy. My (almost) 3 year old LOVED them! Thanks for the recipe! Cool, all kids who we’ve tried have them have loved them too. Glad y’all like them. The consistency difference comes from using applesauce in place of oil. WOW! Just made a batch of these cookies and my whole family loves them! I did substitute a half a cup of the whole wheat flour using almond flour and went ahead and used two whole eggs. I can think of endless kinds of cookies I could make with this base cookie recipie. Does anyone know of a web site i would plug in my ingredient measurements into so i can find out the nutritional value of these cookies? These are AWESOME!! Thank you so much for such a great recipe!! Just made these today, they’re great! I reduced the chocolate chips to 1/4 bag and substituted cooked kashi pilaf for the oatmeal to increase the fiber. The pilaf made the batter more wet so I added about 3/4 cup more flour. They do have a more cake like consistency but I plan to eat them for breakfast. 🙂 Thanks for the recipe! Made these cookies, and they taste amazing! The cookies did have more of a bread-like consistency, but overall the cookie is great! Thanks for the recipe! Hey by any chance do you know how many calories are in one cookie? We made 2 dozen out of the batter. That’s a great idea I hadn’t thought of! I will have to do that with my frozen yogurt. It’s been really tough trying to go healthy but so worth it, especially when you find great alternatives like this. Just made these. They’re awesome! I can’t understand how they can taste as good as or better than normal chocolate chip cookies. And I don’t have to feel guilty or sick after eating them! We’re already thinking about ways to change the recipe, adding peanut butter maybe. We also added the flax seeds since I saw someone say that. Thanks so much for sharing, We’ll probably be making these for our family for life. Yeah, those cookies are like bread or milk on our house – when we run out it’s a bit of an emergency to hurry up and make another batch! Our family LOVES these cookies!!!! My children are actually starting to prefer them over the old way now! YAY!!! However, I can’t compute the freezer thing – we eat them too quickly! I tried making these last night and wow! Very good, and what’s more, they’re satisfying! You’re not going to sit down and eat 6 of these without even thinking about it. Thanks for the recipe! Exactly Muriel, and they’re healthy… can you believe it??!! Glad you like the recipe, God bless. My girlfriend and I found this recipe and thought to do a video of baking a batch. Wow, how delicous! Even with 10 times the amount of salt and nutmeg (ya gotta see the vid) the cookies came out awesome! I wish that your website listed the fat, saturated fat, trans, and calories these sound good but i wish there was a nutrition label posted. Since this info is important to you (it’s not to us) we suggest learning the USDA nutritional values of the ingredients. That research will arm you with the ability to DIY for future recipes that do not list the info. God bless. Thanks for sharing this! I’ve been looking for a healthy substitute for my sweet tooth. Plan on using these to make healthy ice cream sandwiches with froyo!! We’re glad to share the info Ash, glad you like it! AMAZING! I read your recipe and the comments and knew I had to try them. Absolutely delicious. Even my brothers, who hate me trying to make all their favorite desserts healthy, are begging me to make more. Definitely a keeper!! Thank you so much for posting this recipe, they taste great! I subbed half of the oatmeal with Flaxseed Meal to give an extra boost. Didn’t have dark chocolate so I used milk chocolate so not as healthy but I am hoping my kids like them. I love that there is no sugar other than what is in the chocolate in these cookies. Thanks again! These were super yummy cookies. I was surprised when all my children except one loved them too. Thanks for the great recipe. Since I’m lacking applesauce at the moment, I’m going to put part of an apple and two bananas in the blender and see what happens before creaming them with the butter. Question – why do you add an extra egg white? Can I just use a teaspoon or so of water? Hi Dayna, you can do whatever you’d like w/the recipe… don’t be afraid to make it your own. I can tell you that banana will make the cookies much softer, spongier, and more moist… kind of more like cake than cookies, but it tastes great. You could use any type of flour you’d like, but the cookies would of course take on the flavor of the flour used. Hey, i was wondering what you mean by stick butter, where i live butter comes in blocks of cubes in certain grams; could you please let me know how much is 1/2 stick butter in ounces or grams? Also, is the unsweetened apple sauce homemade or commercial? whats more, i cant find the bittersweet chocolate chip cookies by ghirardelli :(..could you please let me know some other substitute to that brand? i really want to bake these cookies, would really appreciate a response 🙂 thanks! Wouldn’t half a stick of butter be 2 ounces? A stick is 4 ounces. Oh yeah, thanks for the correction Patricia… I have a lot of conversion numbers swimming around in my head! Blessings. Great to see you guys too!!! I absolutely love this website…so much great information…great job Matt! My second batch is in the oven now! Thanks for taking the time to maintain such a fun and helpful website – more recipes and DIY products please! WOWZA! These are like a bread cookie! Amazing! I sub’d pecans in place of walnuts and ground them extra fine 😉 I’m not a fan of a nut crunch…I love ’em! I made 18 bars for my hubby to take w him-he is gone w school then work from 630am-8pm…so these should work great!!! Yum Jamie, you’re making me hungry. Just made these cookies! Really loved them. We added ground flaxseed to boost the “healthy”. This recipe is a keeper! Tip for next batch: add 1/2 or less of the Ghirardelli chocolate chips. A full bag is too much for my little princesses! Thank you for sharing! We made your granola recipe too! EXCELLENT! Looking forward to trying your other recipes! I love how you take the recipe and make it your own… you have captured the spirit of diyNatural! Keep it up, and keep coming back for more. These cookies are the best healthy ones I’ve ever tasted and baked! They are absolutely awesome. I love baking . . . what else have you perfected? Thanks Gail. We also make homemade Kefir (yogurt like) every day and are crazy about our granola recipe. How many cookies do you get from the batch? 172 calories, 7g fat, 3g protein, 29 carbs, 2g fiber, 158mg sodium. These cookies are soooo good. My wife & I could not believe how much we liked them. This next time I’m going to try the banana substitution! Yummy. I made these and they were delish! I think it will be a permanent swap in chocolate chip cookie recipe. Extra tips I found, After I put the batter in zip-lock bags I scored them with a chopstick into 12 squares. It made them real easy to break off and since they were stored flat it saves freezer space. Also, about 8 min @ 350 in a toaster oven works perfectly with the frozen dough. Miriam, thanks for that smart tip! What a good plan. Then you have fresh cookies anytime you want them quick! Love it! These sound like yummy cookies. I am thinking of adding some ground up flax seed too. We make our own vanilla extract. Use 2 vanilla beans cut length wise and 2 cups vodka, let it sit in your cupboard for 2-3 months. Rotate two bottles and just add more vodka. Love your website. Thanks for time. Hey! I have been meaning to try these yummy cookies. thanks for the effort to put them together and I see that you used a couple of my recommendations! You are a good boy! These cookies are so good! We make batches & just stick most of them in the freezer (like Tante Benita did) so we have them at all times! Those cookies sound like a serious dose of fiber! Love the organization of the site as well as the content. Thanks for all the info on debt elimination. Some of it is stuff I’ve heard repeatedly from multiple sources, but it never hurts to be reminded because we can all get caught up in the fast and furious pace of this modern life thereby causing us to neglect or forget the most basic of biblical principles. Keep the faith and keep up the good work. I have a similar breakfast cookie recipe that I have been making for my diabetic husband for about 2 years. I add peanut butter Simply Jif and use agave syrup and stevia for the sweetners. This helps with the sugar. I also use the old fashioned oats no quick ones. I put my batch in a big old pan on parchment paper and then after 35 minutes on 350 degrees the bar cookies will come out golden. I use a measuring stick to measure out his cookies for two weeks and we are done. I have gone so far as to use fruit cocktail pureed instead of applesauce when I ran out. Those cookies were great. I did not include the grapes of course. My husband is HOOKED on Debbie’s Peanut Butter Oatmeal Breakfast Cookies. Thanks for listening and God Bless you and our United States of America! Debbie, you should give us the recipe to Debbie’s Peanut Butter Oatmeal Breakfast Cookies, we can publish it as an article here on diyNatural for everyone to enjoy! It would be a huge blessing to any other diabetic readers.